Summary: The impact of direct human disturbance during the nesting process has been challenging to measure. Numerous anecdotal accounts exists of humans approaching turtles and disturbing them leading to false crawls and/or lost clutches. No place is the potential for this type of impact greater than within the Archie Carr National Wildlife Refuge, with critically important nesting beaches interspersed with private homes and adjacent to several densely populated neighborhoods. Though researchers regularly monitor false crawls it is often difficult or impossible to ascribe a cause, whether by humans, wildlife (native or non-native) or for unknown reasons. We propose to utilize a novel photographic system to monitor the causes of false crawls on the 1,000 feet of beach directly in front of the Barrier Island Center, located in the heart of the Archie Carr Refuge. The proposed 61 day study period (June and July 2011) will overlap the guided sea turtle walks that originate at the Center, shedding light on the possible impact of guided walks. Utilizing 6-8 second exposure times and sensitive cameras housed in pelican cases we can take high resolution time stamped images that are bright enough to identify turtles, wildlife and humans that cross within the 1,000 foot study area. To enhance the usefulness of the collected imagery we propose to GPS every nest and false crawl within the study area, to assist with species identification and in determining the cause of each false crawl. Results: During the summer of 2011 light sensitive cameras and GPS mapping were used to document interactions between nesting sea turtles and humans over a 57 day period within the Archie Carr Refuge. The study mapped over 230 turtle tracks on the beach with only 29% resulting in nests. 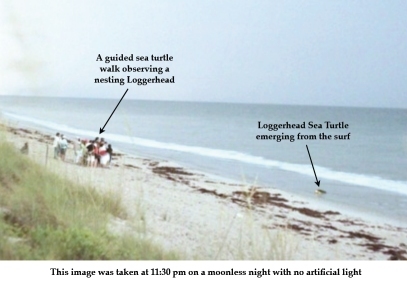 The camera recorded an additional 355 instances where turtles did not emerge from the surf or did not proceed far enough up the beach to be mapped. During the study period the cameras detected a total of 46 instances where humans appear to have interrupted nesting which accounted for less than 9% of the total non-nesting events documented. Download the full A non-invasive approach to documenting human interactions with nesting sea turtles pdf file.